Military pilots around the world deserve to fly with the best and most advanced aviation app, and with every app release ForeFlight MFB delivers new capabilities that advance safety of navigation. ForeFlight MFB is an enhanced version of the ForeFlight Mobile electronic flight bag app that supports the global flight operations of government and military pilots who have authorized access to US Department of Defense Digital Flight Information Publications (D-FLIP). ForeFlight MFB gives military, government, and DOD pilots all of the tools they need for flight planning, weather, briefing, filing, checklist, and more – all in a user-friendly interface that simplifies planning, flying, and flight logging workflows. "Our crews up have conducted several amazing SAR cases during extreme winter conditions utilizing ForeFlight not only as a flight planning tool, but also to increase situational awareness during the flight. The self position, obstacles, profile view, and other functions have been extremely valuable while navigating over both water and land low level." 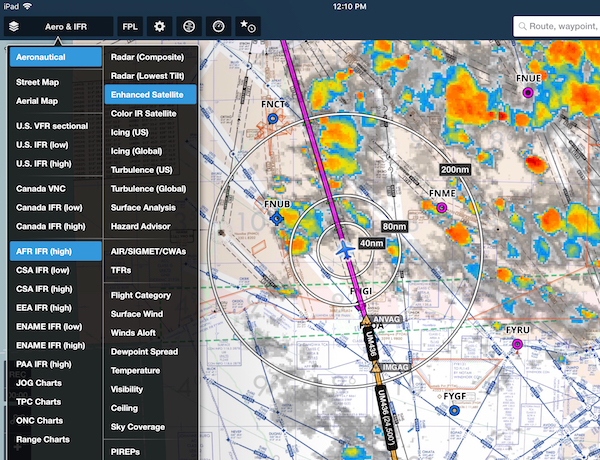 Bullseye is specifically designed to enhance mission planning and tactical decision-making by providing a secure frame of reference in ForeFlight that can be shared among many pilots. Just set the bullseye using coordinates, addresses, waypoints, or any other location type, then measure your own and other’s positions relative to the Bullseye. ForeFlight automatically associates the letter B with the current Bullseye, so you can quickly add any location to your route based on its bearing and direction from the Bullseye. Simplify your preflight workflow and ditch paper when you file flight plans using the new DD-1801 format. ForeFlight will automatically generate a DD-1801 PDF with your flight’s details, then allow you to digitally sign it and send it via email to base ops. 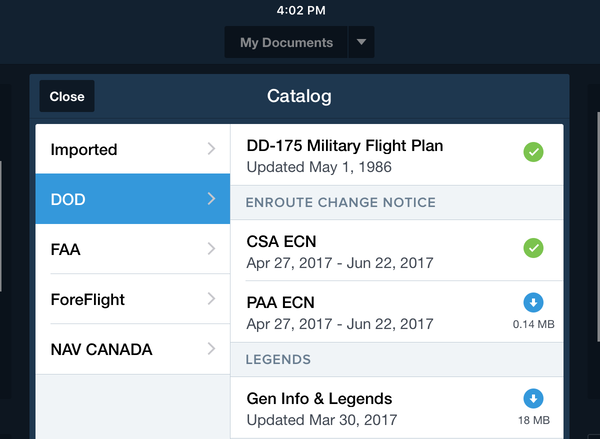 The new DD-1801 filing form is available with all ForeFlight MFB subscription plans. ForeFlight MFB now offers an incredible integration for the military aviator: import your .CRD flight plan files from mission planning systems like JMPS, CFPS, and PFPS and view them directly on ForeFlight’s map. Combined with existing support for mission planning charts like JOG and TPC, along with the innovative Bullseye feature for operational planning and security, .CRD support extends MFB’s mission planning capabilities even further. ForeFlight MFB integrates the global data set of the DAFIF, AQP pages, and D-FLIP terminal procedures, airport diagrams, and enroute charts, all within the ForeFlight app. MFB also includes the full library of VFR charts, IFR High and Low Enroutes, SIDs, STARs, approach plates, airport diagrams, A/FD, and CFS from the FAA and NAV CANADA, global mission planning charts, data-driven Aeronautical Maps, and optional Jeppesen chart library integration. 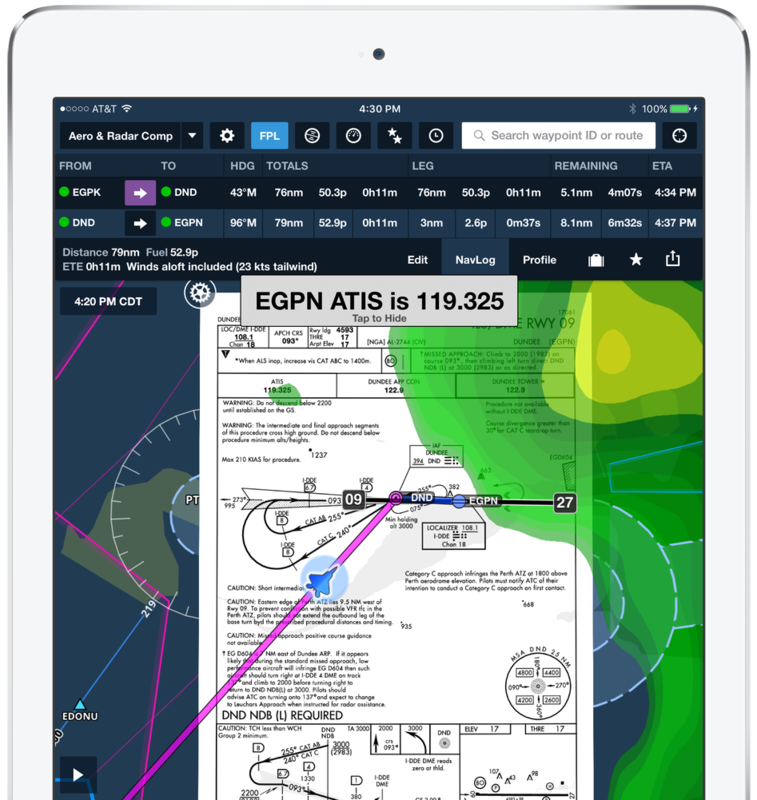 ForeFlight offers the only mobile solution to download and display the complete library of Joint Operations Graphics (JOG), Tactical Pilot Charts (TPC), Operational Navigation Charts (ONC), and Range charts. The charts use the newest format standard in military digital chart technology, developed by the National Geospatial-Intelligence Agency, called Enhanced Compression Raster Graphics (ECRG), and when combined with ForeFlight's compression process technology, the results are faster over-the-air (wireless) downloads, less storage space, higher resolution, and quicker load times. An innovative new Graphical Chart Manager makes it easy to select and download large areas of chart coverage. Graphical Chart Manager makes it easy and intuitive to manage the vast library of mission planning charts. Tap on individual charts to select them or use the ‘draw to select’ interface to select a larger geographic area by simply using a finger or stylus to draw a shape on the map around the area for which you want to download charts. Because the charts are downloaded onto the iPad, you can access them anytime on the ground and in the air. For greater situational awareness, the library of D-FLIP, FAA, and NAVCANADA terminal procedures and airport diagrams is geo-referenced so that you can view your aircraft ownship position right on the chart. Plates on Maps allows you to view geo-referenced approach plates and airport diagrams overlaid onto the maps view, along with hazards and weather in one seamless view. Access approved weather data from the 557th Weather Wing, the official weather source for the U.S. Air Force and Army, directly in ForeFlight. 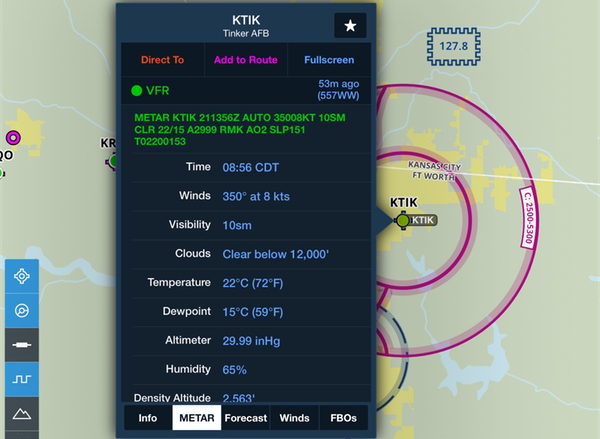 This integrated weather source provides METAR and TAF data for hundreds of airports and bases in the U.S. and around the world. Download and access all D-FLIP publications, including Area Planning pubs, the Flight Information Handbook, General Planning, Supplements, VFR Routes, and more from the ForeFlight library. 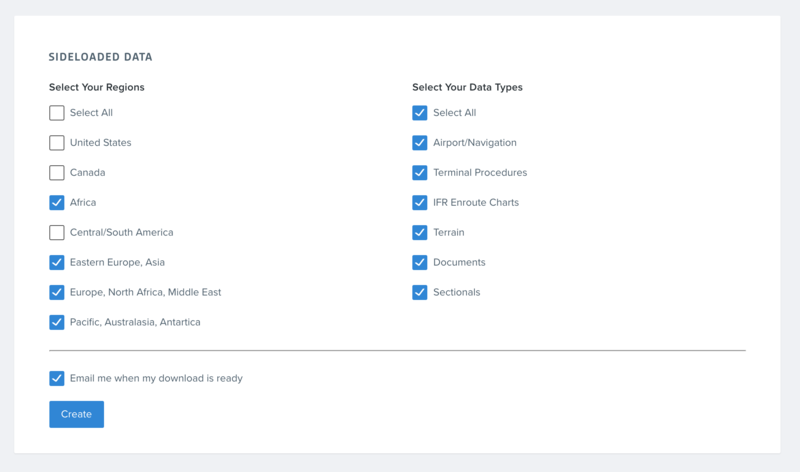 Securely import and distribute flight manuals, operating handbooks, or special procedures to every flight crew member via a connected cloud service like Amazon S3 or Box.com. Easily import and manage a variety of custom data types via remote sideloading, email attachment, AirDrop, or hyperlink. Bulk import user waypoints, create custom overlays with KML geographic shapefiles, or bring your own geo-referenced charts to ForeFlight with support for the MBTiles open source file type. Sideloading allows charts and data to be delivered to multiple devices by connecting them to a central computer which has the data already on it. A helpful capability if you operate in areas with slow or no internet service. Fly with more confidence in all conditions and terrain with this visually stunning and high-performance hazard awareness capability for iPad. ForeFlight’s Synthetic Vision uses Jeppesen’s high-resolution terrain data sets, designed for use in certified panel-mounted avionics. As an individual pilot, you can purchase ForeFlight MFB directly through the ForeFlight website. First, you'll need to verify your email address. Click the button below to begin the authentication process. Individual MFB subscriptions purchased from ForeFlight are $299.99 USD per year for MFB Performance and $199.99 USD per year for MFB Pro. Multi-pilot accounts are great for crews who wish to manage ForeFlight access for two or more pilots in a single administrative interface. Establishing a shared group account enables helpful administrative control features. 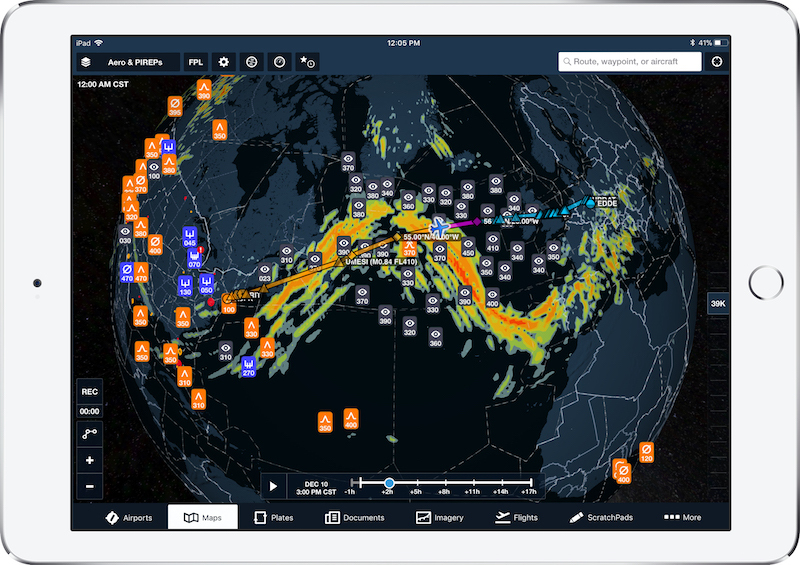 EFB managers can log in to ForeFlight’s web-based dashboard to add or remove users and devices, monitor data and software currency compliance on each device, and easily distribute documents to every pilot’s iPad. Funding for new MFB multi-pilot subscriptions may be transferred to the Defense Logistics Agency (DLA) through a Military Interdepartmental Purchase Request (MIPR).